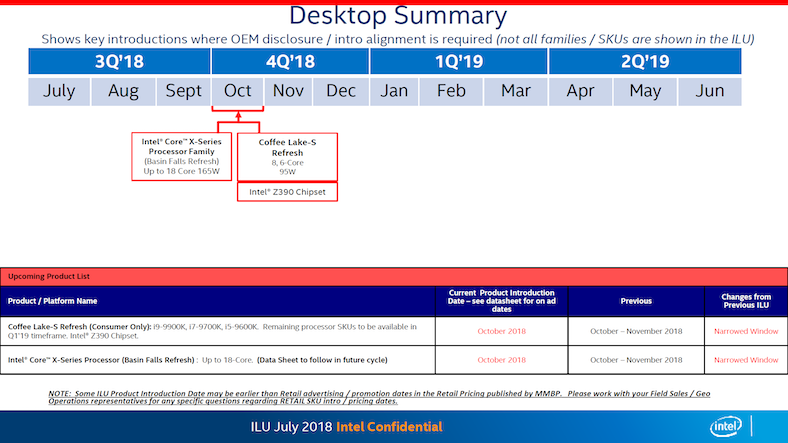 Intel’s end-2019 roadmap was leaked by two different sources. According to the information obtained, Intel has 5 new CPUs ready. Intel’s future plans are out. The company’s roadmap was leaked by two different technology sites. According to leaked information, Intel introduced five new HEDT (High-End Desktop); in other words ready to produce the Top Level Desktop processor. This leak, originally proposed by WccfTech, unleashed all of Intel’s plans from 2018 until the third quarter of 2019. According to previous information, it was thought that Intel 9th generation processors will not be produced until the next year, but according to the leaked roadmap, 9th generation processors are coming this year. This means that in the next few months we will meet the 9th generation Coffee Lake-S series of processors. New generation Coffee Lake-S processors; 8, 6, 4 and 2 cores will come out in different options. This leak has also disproved the claim that “dual-core processors will no longer be produced”. One of the most important details of the leaking roadmap is the new generation of Coffee Lake-S processors; both Intel’s new motherboard, the Z390 and the older 300 series, will support the motherboard. According to leaked information, we will see a number of new processors at a much higher level than we expected in the coming period. Basin Falls X series processors to be introduced before the Coffee Lake-S series; 18, 16, 14, 12, 10, 8 and 6 core will come out with different options. There is no information yet on whether this new series will be compatible with the X299 motherboards. Glacier Falls processors, the continuation of this series, are expected to meet users in the third quarter of 2019, but there are no more details about this series. Intel, the 28-core processor that will introduce, has chosen to keep it separate. Called the Skylake XE Series, this processor will be challenged in the fourth quarter of 2018. In addition to the roadmap leaked by WccfTech, a road map was leaked by HKEPC. According to this information, Intel’s 9th generation processors will be introduced next October. This information, which does not exactly coincide with the other leak, confuses the heads a little more. 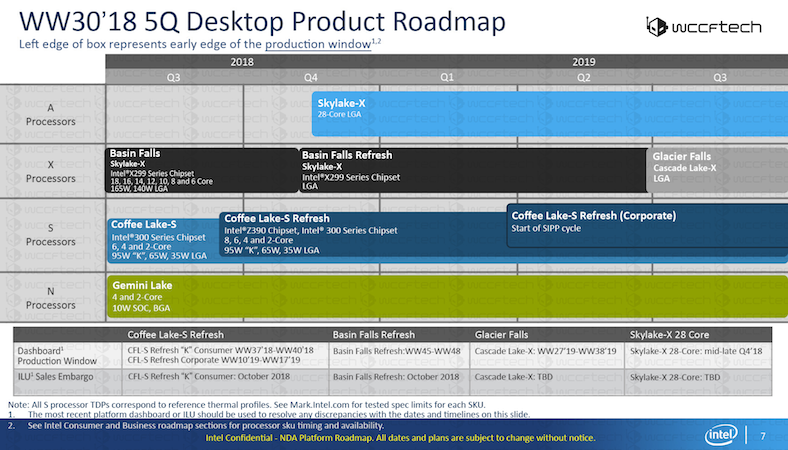 There is a point that both road maps agree; it is also to be introduced in the 4th quarter of 2018 of the Intel Core X series, Basin Falls processors. Although the accuracy of such leaks is doubtful, we often get a little idea. The only thing we need to do to verify Intel’s claims of leaked plans is to wait for the timeframes involved.